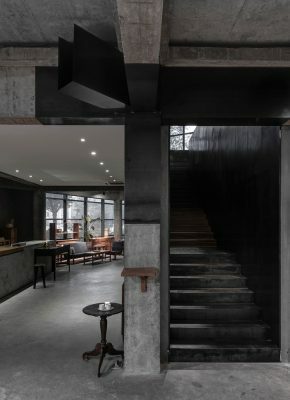 Commercial Interior in China – design by AN Interior Design Co.
Design: AN Interior Design Co. 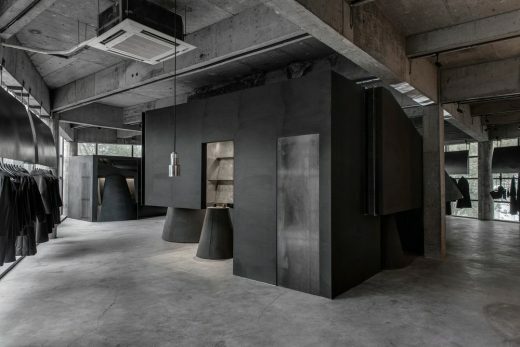 The HEIKE fashion brand concept store is hidden on the second floor of a furniture store. 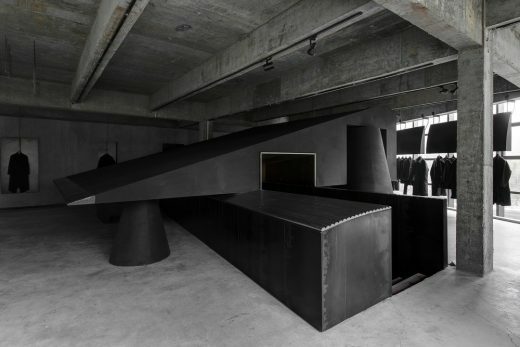 A narrow staircase in the middle of the store leads to HEIKE. 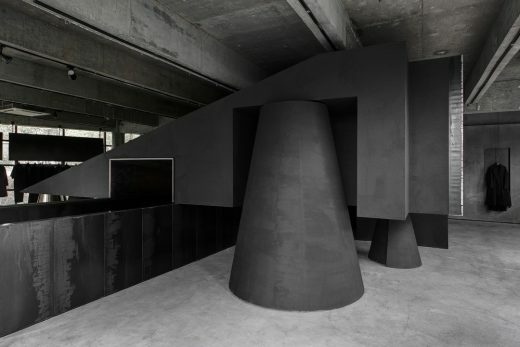 The crossing of the space between the two levels, the stairway, is simultaneously concealed and enhanced by a sculptural black block. 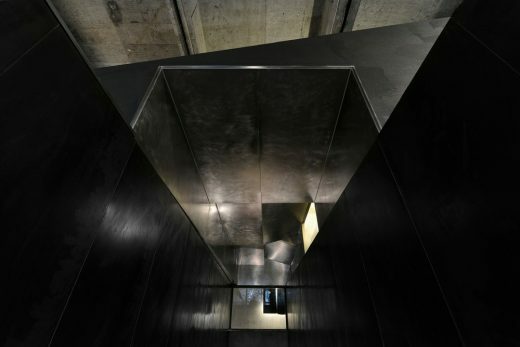 Named the ‘Black Cant’, this large slanted wedge separates by connecting and incorporates the passage from the ground to the first floor. It also includes the container for the fitting room and stock areas. 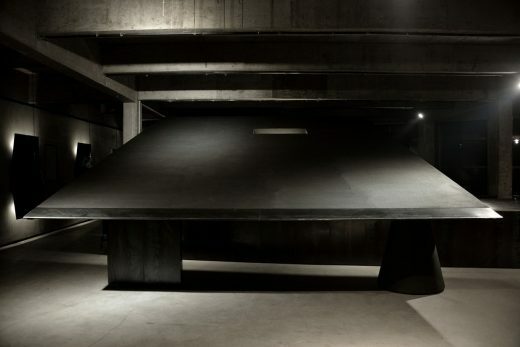 The dark and invasive volume is inserted by the architects as a ‘text’ on a blank page and serves as a store and a gallery for exhibitions and events. 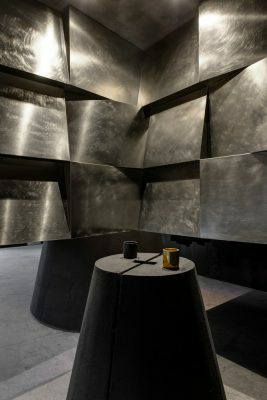 HEIKE is achieved with geometric, cutting shapes, minimal furnishing and a varied range of materials such as concrete, steel, aluminum and mirrors. 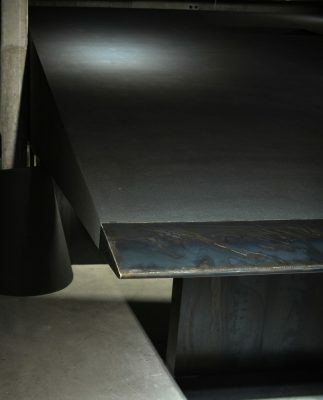 Different textures were used to create matt and shiny surfaces, all of them in strictly gray and black shades, eloquent signs of craftsmanship. 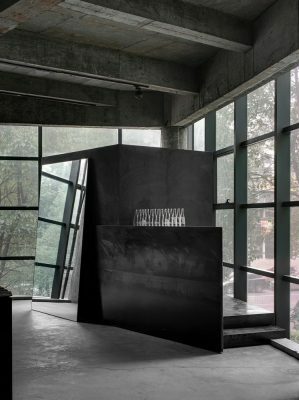 Other examples is the raw concrete construction, contrasting with the polished floors, the steel window structures, the hangers, the intensely black marble dust finish and the polished metals. 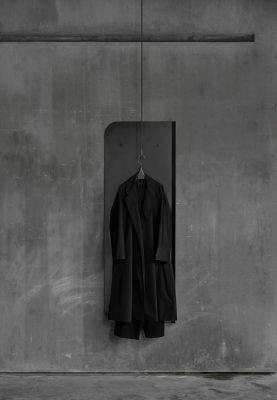 Founded in 2011 by partners Shanwei Weng and Jiadie Yuan, AN Design gets rid of the inertial thinking and tries to think in a new way with the changing teamwork. They are mainly engaged in space design, product design, graphic design, small buildings design and renovation and collaborate closely with the construction team. AN thinks that design is writing. 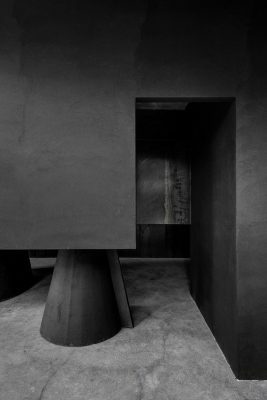 The material, the lights, the details and the experience is ambulatory, they can break with conventions to reach a new state. Website: AN Interior Design Co.